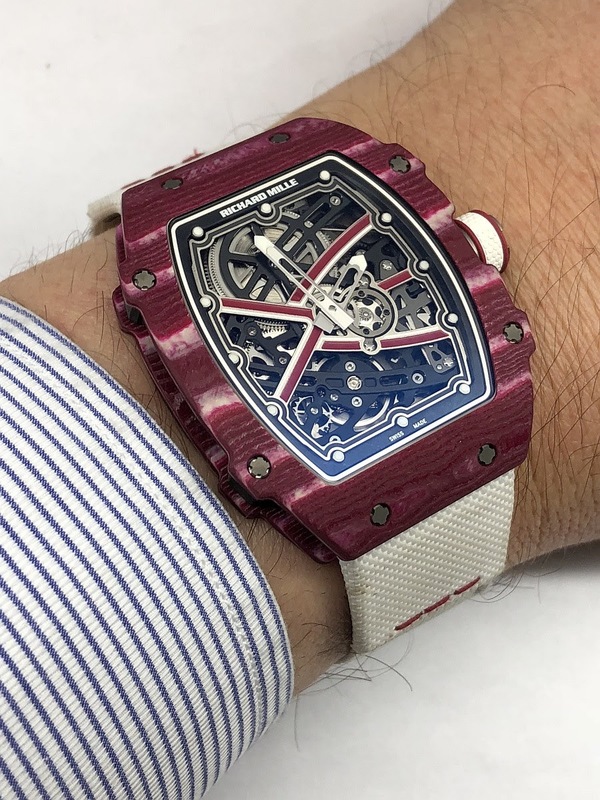 There is a kind of paradoxical side, even ironic when I observe the Richard Mille RM67-02 which was presented during the last IAAF World Championships in 2017 and that I had the opportunity to discover during the last SIHH. One of the two ambassadors of this ultra-thin watch is Mutaz Essa Barshim who is nothing other than a High Jump champion! I don't know if this slender and elegant athlete, who was able to clear the horizontal bar at 2m43 is best placed to evoke the finesse of the RM67-02 High Jump. But one thing is certain: thanks to his skills, his Qatari nationality and the pleasure he feels by wearing this watch, including during official events, Mutaz Essa Barshim is a very convincing flag bearer of the Richard Mille style. I really like this watch for two reasons. The first reason is that it is a variation of the RM67-01, one of my favorite Richard Mille "simple" watches. The second reason is that this sportive development (I would rather say: transformation) is successful because not only it does bring many aesthetic differences compared to the basic watch but in addition it is totally convincing from the practical point of view. 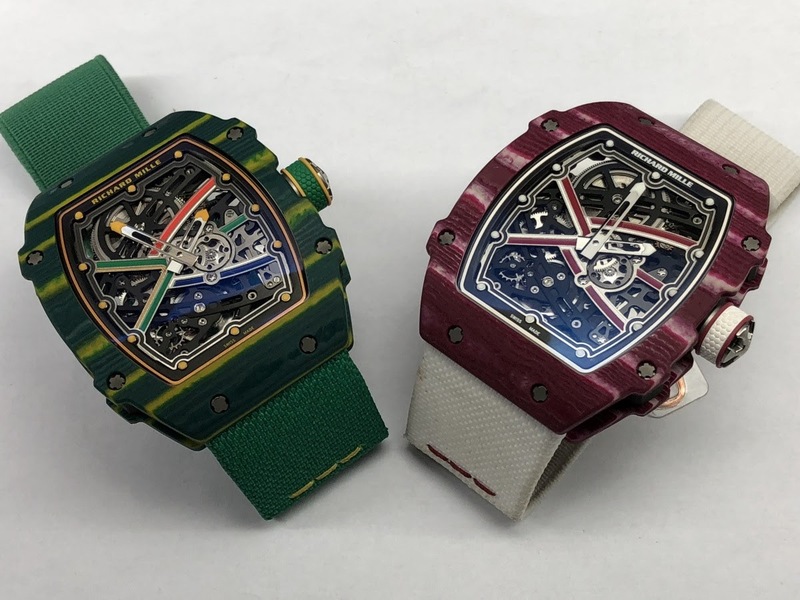 In fact, despite its apparent simplicity (the RM67-02 is after all a two-hand watch), it contains all that makes the success of a Richard Mille watch: a daring design, performances that correspond to the intended use and original and innovative solutions. The RM67-01 seduced me during its presentation 2 years ago thanks to its case that I found particularly successful. It reinterpreted with elegance and refinement the traditional tonneau-shaped case of the brand. Its finesse didn't make it lose any character because the proportions remained homogeneous and allowed the watch to keep an energetic side. Similarly, despite the flat rendering, the feeling of depth was perceptible thanks to the architecture of the movement and the open dial. So I found again with pleasure through RM67-02 these identical proportions but in a clearly distinct aesthetic context. 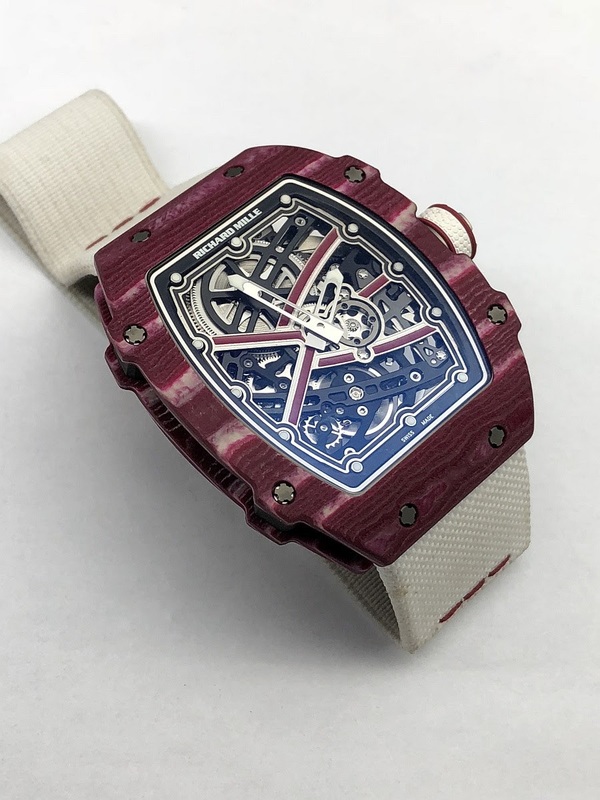 Apart from its range of colors which is the first element that we clearly notice, the case of the RM67-02 offers a detail that changes the vocation of the watch: thanks to the 4 extensions, which are the signature of the Richard Mille sports watches, the RM67-02 leaves the cozy atmosphere of its predecessor to end up on the tartan tracks. These crenellations break the fluidity of the lines of the original watch and give a much more manly appearance. But, and that's all the success of the design, the watch doesn't lose its subtlety. The case consists of three distinct parts. The bezel and the caseback are made of quartz TPT which is made up of multiple layers of silica laments impregnated with a special resin of purple color, thus defining the dominant color of the watch. The caseside is made of carbon TPT, following a similar principle but with carbon fibres. The rendering is spectacular, regular and marbled at the same time. It is as if a hint of hazard had been inserted into a rigorous construction. Anyway, the outcome is reached: the case, despite its thickness of 7.80mm, offers a very high resistance to shocks which makes it suitable for various sports practices including obviously high jump! In addition, it contributes, as well as the strap and the movement, to the extreme lightness of the watch. So think about it: with a total weight of 32 grams on the scale, the RM67-02 is a real featherweight! Featherweight but not a small sized timepiece because the slender style remains with dimensions of 38.70mm x 47.25mm. This size is significant, especially for a non-round watch. However, because of the thickness of the bezel and the limited dial opening, the watch seems to be smaller when on the wrist. Let's talk about the strap. I address here one of the key points, not to say fundamental of the RM67-02: its strap. It is useless to create a light watch, resistant, dedicated to a sportive activity if it moves on the wrist. It was therefore necessary to find a strap which would perfectly maintain the case including during quick moves of the arm. The woven strap of the RM67-02 is a model of its kind. It is totally seamless, non-slip and is used as a wrist band. Its elasticity is perfectly balanced even if its handling surprised me the first time. I was afraid to pull too much and break "the fasteners". But I had nothing to fear. The bracelet is reinforced with titanium inserts and I could have tested the elasticity further. It doesn't matter after all because I could feel the essential: the comfort is optimal, the strap tightens the wrist without squeezing it, the skin breathes and the watch never moves even during handshakes or big arm moves. This strap is the ideal complement to the RM67-02. 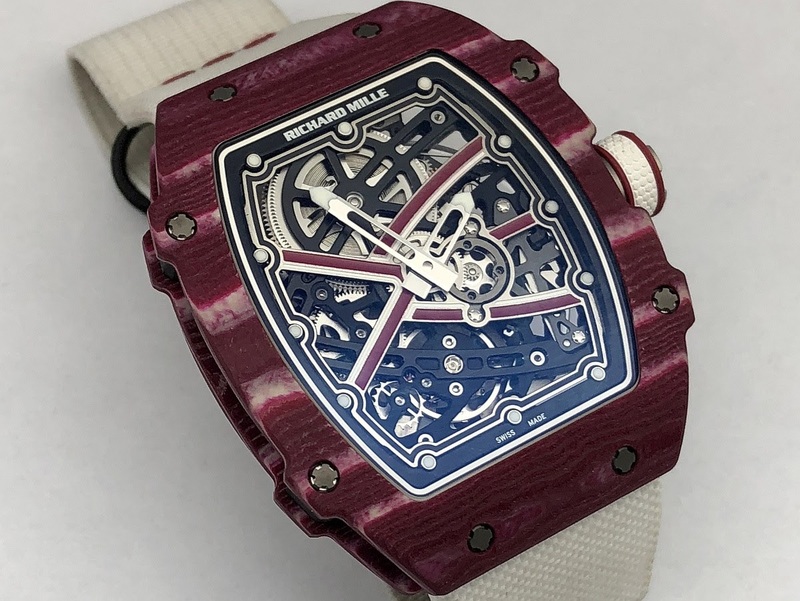 And that's what I like about Richard Mille: the slightest detail is conceived in coherence with the targetted objective. The dial of the RM67-02, made of titanium and treated with black DLC coating, also has many surprises, especially when compared to the RM67-01 one. To tell the truth ... everything has changed even if the state of mind remains. We can say goodbye to the numerals and to the structure on which they were located, goodbye to the additional complications (date and display of the crown functions). A new presentation is implemented with thicker, more pronounced lines, drawing more raw shapes. Most of these lines are hand painted to create a welcome reminder with the purple color of the bezel. The overall rendering is both geometric and detailed because the moving parts of the movement are very visible (the balance wheel is notably more noticeable with the RM67-02 than with the RM67-01). To fully enjoy the show, the satin-finished hands are hollowed. From an aesthetic point of view, it's a benefit. The observation of the contemporary architecture of the movement is very nice. But from the practical point of view, it's a drawback: despite the treatment of their ends, they tend to get lost in the intertwining of the movement and the readability is affected. It is a pity because I like this dial and its aesthetic coherence with the bezel. The RM67-02 is powered by the in-house caliber CRMA7, which, as its name implies, is in line with the CRMA6 which is used for the RM67-01. In fact, the technical features and performances are similar: a 4hz frequency, a power reserve of about fifty hours for a thickness of 3.6mm. Like the dial, it is machined from a sheet of titanium and treated with black DLC coating. I really like the presentation of the winding mass and the shapes of the bridges. The fast-rotating barrel and the teeth odf the wheels with special profiles optimize the energy consumption and ensure the most constant behavior possible along the power reserve. Finally, the free-sprung balance variable inertia, protected by a transparent incabloc, has been designed for a better impact resistance and offers direct adjustment thanks to the 4 small weights. The RM67-02 High Jump is a watch that I like a lot. I am fully aware that it doesn't leave indifferent given its particular aesthetic and its dominant color. It is a true love & hate watch. 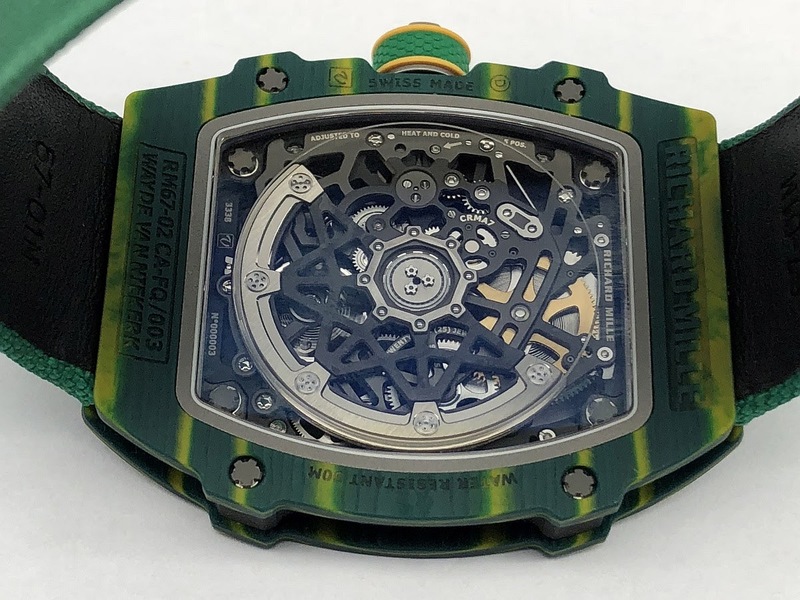 But it perfectly symbolizes the approach from Richard Mille. 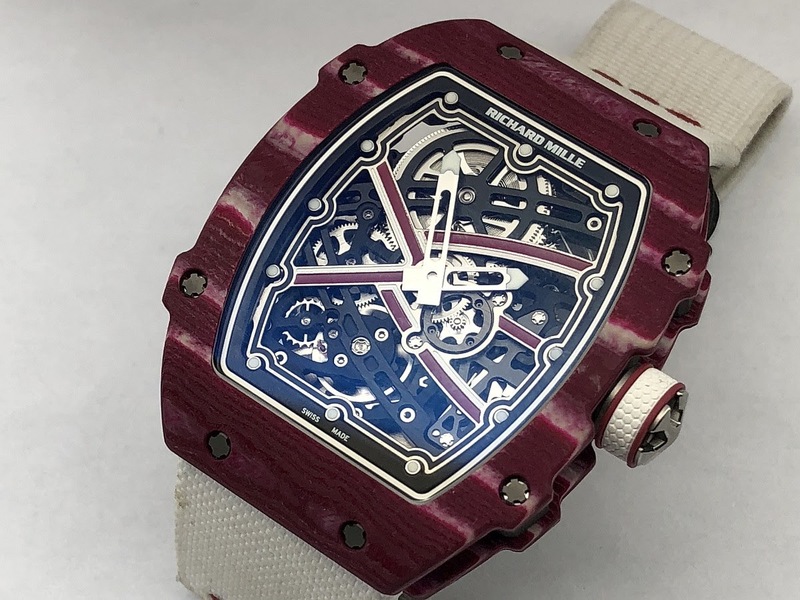 It is a two-hand watch and yet it was designed with the same care and the same desire to push its performance to the extreme than with a much more complicated watch what explains its stratospheric price (132,000 euros including tax) . The transformation of the RM67-01 into a sports watch is therefore a success. The RM67-02 catches the eye but it can be totally forgotten on the wrist thanks to its lightness and its comfort. I could almost feel my wings growing when I wore it. I'm sure that with these additional 32 grams, I would be able to jump higher! Thanks for this well proportioned report. From my understanding... RM will make a bunch of different flavors of 67 this year. It will become a more mainstream model for them. I can appreciate the workmanship of the movement... ...but would have to wear a second watch (or use my phone) to know the time.